Provides scholarships to youth who have experienced homelessness to ensure their completion of a post-secondary education program. $2,000 scholarship award ($1,000 for the 1st year, $1,000 for the 2nd year of college). A minimum of 10 scholarships are awarded. Trip to a national awards ceremony (travel and expenses included). Second gathering in Washington, DC, 18 months after the initial scholarship award (all expenses included). Applicants must be entering college for the first time during the 2019-20 school year. This means that the application is for high school seniors; for those who are in GED programs; or for those who have taken a gap year. For more information, please contact Barbara Duffield (barbara@schoolhouseconnection.org). Below are some of the frequently asked questions about the scholarship program. 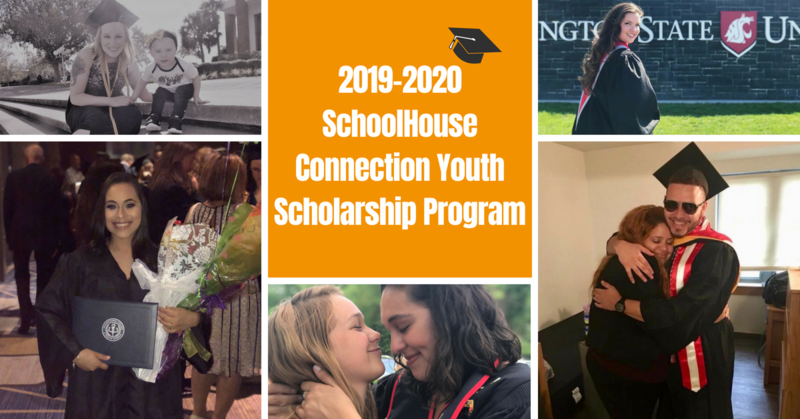 If you have further questions, please contact barbara@schoolhouseconnection.org. How recent does my homelessness have to be to apply? Within the last six years. What do you consider homeless? I've never stayed in a shelter or outside. My GPA is lower than I'd like because I had some rough semesters/years. Am I still eligible? We do not have a minimum GPA requirement. If you meet the criteria, you should apply! We know that the circumstances of homelessness can cause periods of academic hardship. The essay component of the application is the best place to explain your academic performance and any information you would like us to consider. I'm having trouble loading documents to your system. What do I do? Please refresh the system and make sure you are loading a file type that the system accepts. If those efforts do not work, please email Amy Bradley at Amy@SchoolHouseConnection.org. We want your application to be complete! I am taking a gap year. Am I still eligible? Yes. As long as you graduated high school or completed a GED program and have a birthday on or after Nov. 9, 1998, you are eligible. Can I submit an essay that I used for my college application for your scholarship? Our essay asks for some specific information about your education and experience with homelessness. It is unlikely that other essays will match our criteria. Please consider writing an essay specific to our scholarship, as we read and consider each essay carefully. I have undocumented status. Am I still eligible for your scholarship? Some of the details of my homelessness and my life seem too personal to share. Do you want to read essays with personal details? It is your choice to withhold any details that you do not want to share. Essays are confidential, and are not shared with anyone outside of the selection committee. I have not been identified as homeless by my school but I am experiencing/ have experienced homelessness. Am I eligible? Yes. You may apply for our scholarship even if you have not been identified as homeless by your school. I am currently 19 years old. Is that the right age to apply? Yes. Anyone who was born on or after Nov. 9, 1998 is eligible.